If you have a little one you’ll know how hard it is to restrict their sugar intake over Easter. Fortunately Usborne books have come to the rescue and I think these little board books would make a great gift instead of yet another Easter egg! For children who love the ‘That’s not my…’ series there are volumes on bunny’s and chick’s which are so adorably cute you wont be able to resist reading them. At just £6.99 each you’ll get loads of use out of these, my eldest who is ten had lots of the “That’s not my…’ books and reading them with him was such an important part of his toddler years I’ve still got them. 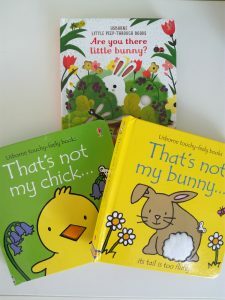 For toddlers that like peep through books Usborne have produced Are you there little bunny? which is so lovely that you’ll definitely end up reading it many times! It priced at just £5.99 which I think is money well spent!